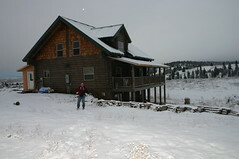 This blog is for the Kirby Records family and friends to keep up with whats gong on back at the cabin. I will try to keep it going with interesting stories of our life as they occur and any new information on the Records/Isaac geneaology. Please feel free to contribute your own stories. New years eve 2004. We went to pendleton today and visited the Tamatskilitk (sp?) cultural center,and the Pendleton Woolen Mills. I intend to buy one of their blankets one day but the one I want is a bit expensive for me just yet. As you can see we have snow again and the promise of more on the way. I hope where ever you are you are having a happy new years eve. 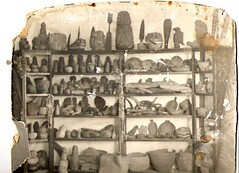 Helen Kane Kunzie is the collector of the artifacts in the photograph from a few blogs back. 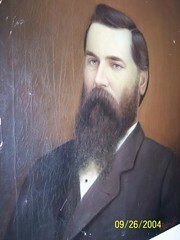 My Cousin Mary Dennie sent me these pictures of paintings that have been handed down through the family over the years. One thing about my job is we only work 3 days between Christmas and new years. So after covering for Donny out of the CA branch. I am now done for another 3 day weekend. Oh if they could all be 3 day weekends. It is snowing here and the ground is white again. We are ready for it now. Shelly has to leave in the morning so she will have to deal with it going over the mountain but she should do ok.
You guys can leave a comment by clicking on the comment line below a post and then following the lead. Lakota word for the day: Wastelaka pronounced "wash tay lock A" means to like something. Hooray, I sold the old chevy today to a young man who is going off to Wyoming Tech to be a mechanic! Cool, he will be able to keep it running in better shape than I did. Lakota word for today: Hoga "fish" I have a friend I call Hogatanka wa ouspe "fish,big, he catches" he took me out and helped me catch a 40 pound salmon. that fish could have swallowed whole the biggest fish I am used to catching! We are going again next year. Christmas is done. 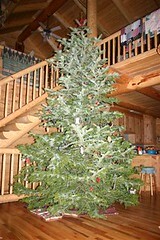 this is a photo of our 14ft plus tree. If we had a larger front door and a bigger tree stand we could go another 10 feet! We had Kevin and Shelly here as well as Cherries mom and dad. Tyson worked on the ambulance in Conneticut, Kalyn was in New Zealand still (but we are expecting here home soon!) Shane was in Portland with some friends, and Robert called in sick. I did get a call from both Tyson and Shane. Mom and dad had the Trapps over for dinner on the 25th so we all had a fairly quiet celebration. The weather has been good. No new snow but they keep forecasting it. We had the company x-mas dinner at "10 Depot Street" it was good but expensive. Keith , Sharon, Dan & Brandy, and Cherrie and I all had a good visit. Cherrie has been modifying a wedding dress for the Girls coach here in North Powder. She is getting married on new years eve and was desperate for help. Cherrie as usual works miricles with fabric. Kalyn updated her web journal today so I know things are still ok with her. I got a phone call from Tyson this week, he will be working through the hollidays. I haven't heard from Shane since his school let out for the holidays he said he would probly not make it out here. We are expecting Robert and Shelly home for X-Mas probably by this Thursday and Friday. Mom and dad got home today, I helped them unload and get dad into the house. Cherrie rounded up a walker for him so he has that untill he gets his balance and such. He starts physical therapy next week in Baker. Cherrie and I finished up the tasks around the outside of our house. We got the two dors in the porch and some insulation arround the cracks. I think this time we are ready for the snow that is predicted for tomorrow. 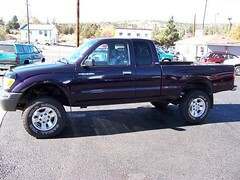 Here is a picture of my truck. This is the picture they used to advertise it and was taken in Bend. I sure do like it! even if it is purple! Dad is out of the hospital and is spending the night a Dougs & Terra's house. Mom will bring him on home tomorrow. He is happy with his new knee but it is tiring him out. Mom said he was sleeping better this afternoon at Dougs house. I went to Ontario with my friend Brad for a fur sale. we learned alot about trapping and that is isn't worth the effort unless you are doing it for fun and using the hides for your own purpose. Brad came back with all his furs and is planning on tanning them himself. Kevin and Cherrie got a big christmas tree today I'm guessing it at about 12-13ft tall. it has sure made the house smell good. As I indicated in my first post, I want to try to do some Geneology information sharing . 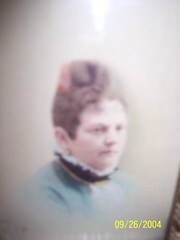 Following is a picture that has been in my family since the late 1800's I recently figured out what it is all about. The items shown were in my great great grandmothers collection of indian artifacts she gathered around her land at Umatilla Landing in the mid 1800's. In the 1890's she sold a lot of the collection off in pieces to support herself. I believe the picture matches fairly closely the items she listed in a letter to the smithsonian. They had requested a photograph and maybe this is one she had taken to show what she had for sale. In the Picture on the top shelf to the right is a club (to the left of the "birdman" figure") This club and one other piece were purchased from Mrs. Helen Kunzie in the 1890's . The club is called a "Patu", it is solid brass modled after a weapon of New Zealand natives. This particular "Patu" turns out to be made in England in the 1700's and sailed with captain cook as a trade item. It was traded on Cook's third voyage to natives in Nanook Bay in Alaska. Over the next 100 years it made its way to north eastern Oregon and into Mrs. Kunzies' collection via the Umatilla natives. It was then sold and shipped by train to the Smithsonian Institution and has been recently recommended for repatriation to the federated tribes of the Umatilla. Hopefully it will be displayed at their museum in Pendleton and I can go see it in person! The piece of land that the old Wolf creek schoolhouse remains were on was sold last summer. The new owners tore down what was left of the old cement foundation that had supported a brick building today to make room for a new house. A land mark that has been there as long as I can remember is gone. Mom called and said other than the morphine making him sick and objections to a catheter, Dad came through the operation well. Doug Stopped by to talk with him yester day but he didn't remember as he was on heavy medication. Mom thinks he may be able to come home by Saturday. I was mistaken, the operation was yesterday morning. Snow is mostly melted off, it is getting colder again. My dad went to Boise Monday and should have been in surgery yesterday for a knee replacement. I haven't heard back from mom yet as to how it is going. They said he could be there at the hospital up to a week. I have been answering the phones at work for both the Oregon and the California branch the last two days because my counter part, Don Lee is out sick. The snow is almost all melted off and now it is supposed to be getting colder again. Last night by the light of the purple truck,I shoveled dirt/mud trying to fill in the pod forming in the back fill area around the foundation for the garage. I will be trying to get as much of that done as I can or next spring will be a bigger mess. Cherrie is beginning to make christmas goodies. And I got my sculpy clay so I need to start making the 2004 tree ornaments for the kids. We finaly got the porch roof on. The weather was nicer for us this weekend , warmer but that brought lots of mud . I tried to dig a trench to drain the pond forming around the garage foundation. I will probly have to keep working on filling up that hole until the ground freezes to keep the pond that will form next spring to a minimum. We got one door in and the window for the porch. The other door is due to be here by next weekend. perhaps we can get some of the insulation in by then as well. Another snowy day, I shoveled through a 3ft drift to get out to my pickup this morning and although it warmed up a bit it is snowing again tonight. Weather is snowing and blowing today. I got an email from Kalyn in New Zealand, she is comming back in about 3 weeks. I also talked to Shane who is attending Southern Oregon State, He was working on recording his guitar playing along with computer generated percussion on his computer. Hellow family and friends. I am going to try this experiment after reading my daughters journal from her trip to New Zealand weather I can keep that many posts going I do not know but I will try and see what interests we develope. Status of the House: Cherrie and I have mostly completed the log cabin however we are adding a front porch now and have it roughly framed in. We are working in very cold weather with about a foot of snow on the ground. We got the garage footings and stem walls pured but are going to let that wait until better weather.